they are all pulling together. Our relationships are both a foundation and an expression of who we are. We do not exist as separate, isolated beings, but members of families, groups, societies, and the Earth community; members of an unfolding interconnected humanity which is itself an expression of a singularity of consciousness; therefore, we grow through relationships and in relationship to others. 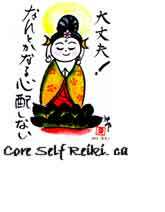 In the world of Reiki Ryoho, the creation of communities (Reiki Practice Circles /Shares) is essential. Reiki students meet for the purpose of deepening their understanding of Reiki Ryoho, sharing thoughts and experiences, developing their energy healing ability, practicing inner stillness, and exchanging treatments, thus assisting each other in becoming more clear, more balanced, more awake. Our Reiki Practice Circle meets every other Sunday, between 10a.m. and 1:30p.m. in Don Mills, Toronto. The venue is easily accesible by both car and public transportation. For specific dates, location, or other details, please contact Elyssa Matthews.